Tell Him Your Plans is the title of our bumper tenth issue. 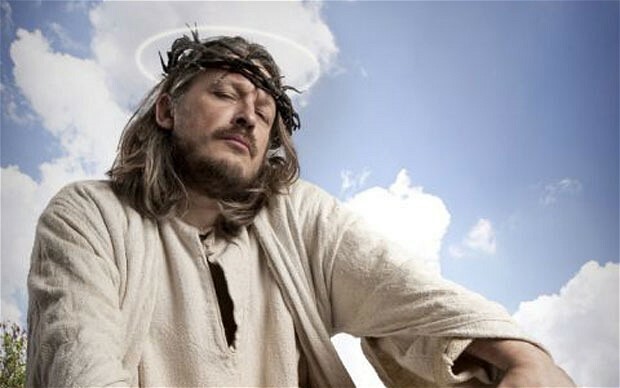 It comes from the joke: How do you make God laugh? Tell Him your plans. The joke sits at the heart of this issue’s theme: absurdity. 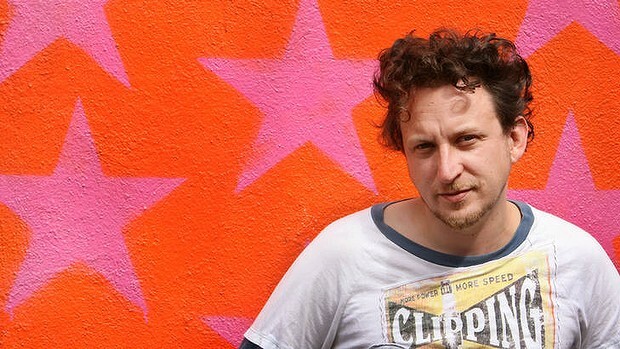 The issue has interviews with acclaimed novelist EWAN MORRISON and master comedian RICHARD HERRING. We’ve also got David Cain from Raptitude on his new-found, post-job liberty; Robert Wringham on the disorienting pleasure of walking through the wrong door; Reggie C King on Ambrose Bierce; Dickon Edwards on Pinter; a new essay from Justin Reynolds; and a story of sick-day freedom by Allan Wilson. If that weren’t enough, there’s an astonishing cameo from the Wise Space Baby from the end of 2001: a space odyssey! What would he make of all this? I think he’d like it. 104 independently-produced, beautifully-typeset, entertainingly-illustrated pages for just £6 (or £5 on PDF). It’s an astonishing tenth issue. Our biggest and arguably best to date. Buy it now from the online shop in print or PDF. 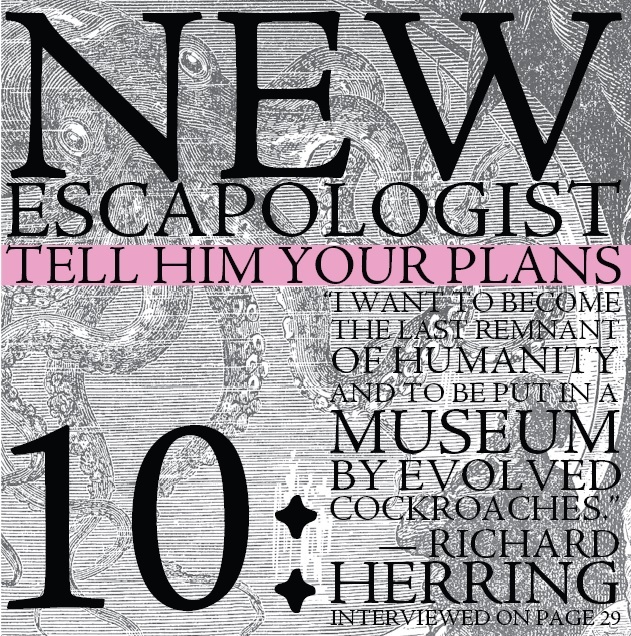 Issue Ten of New Escapologist is almost ready to fly the nest. Buy the new Issue Nine in print or on PDF today. I’ve been reading a lot of Gerald Durrell lately. His short story, The Talking Head, was one of the most entertaining things I’ve ever read. Not an improving text, just a deeply delightful bit of memoir. Durrell was a naturalist first and foremost, and wrote about his various expeditions to rescue endangered species around the world, but he’s equally well-known for books like My Family and Other Animals in which he relates adventures had with his family while growing up on Corfu. …we were in those days, and certainly by Greek standards, comparatively wealthy; none of us worked in the accepted sense of the word and therefore most of our time was spent having fun. If you have five years of doing this, you accumulate quite a lot of experiences. Rather than being an end in itself, their wealth allowed them to do away with time-wasting work and granted them the freedom to fill their time with pleasing activity. As a family they spent most of their time on Corfu going on long walks, entertaining guests and throwing parties. Gerry’s brother Larry used his time to become a highly celebrated novelist. His other brother Leslie mainly spent his time studying ballistics for fun. Both are perfectly decent ways to spend a life. Gerry himself spent his childhood exploring the island, hob-nobbing with peasants and aristocracy, collecting a bewildering range of animals (owls, spiders, puppies, fish, snails, turtles) for his home menagerie, and being tutored by eccentric local autodidacts. Sounds like an education to me. 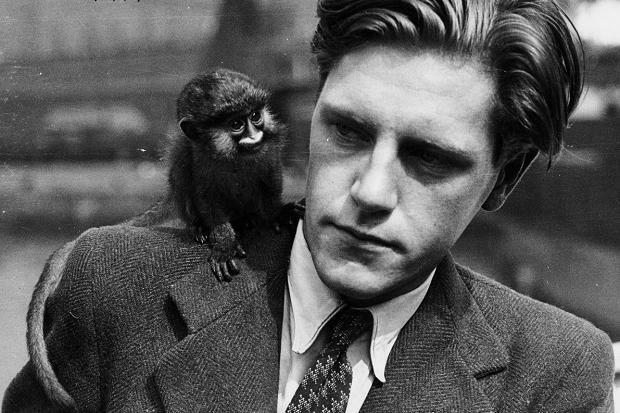 In later life, Gerry became a professional naturalist and helped change the focus of zoos from spectacle to conservation. His legacy (in addition to his astonishing output of 42 books) is the Durrell Wildlife Park on the island of Jersey. For subscribers and those who have pre-ordered print or PDF copies, it’ll be on your doormats or in your inboxes in just a few days. 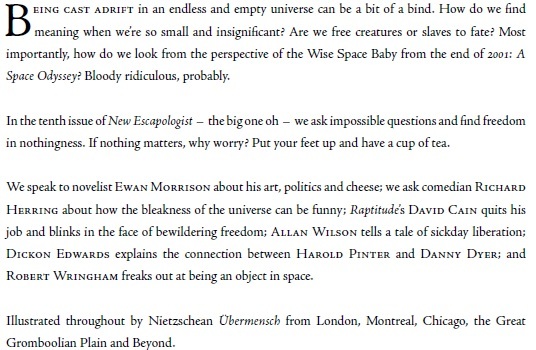 Here’s a sneak preview of the Table of Contents. This bumper tenth issue is dedicated to ABSURDITY. Featuring interviews with novelist Ewan Morrison and comedian Richard Herring; Raptitude’s David Cain on his new-found, post-job liberty; Robert Wringham on the walking through the wrong door; a short story of sick-day freedom by Allan Wilson; and Samara Leibner on why she hates drawers. Pre-order today. 104 pages. Reggie draws our attention to a “borrowing shop” in Berlin. The idea is simple. The shop has a stock of useful things like tools. Customers borrow the items as if the shop were a lending library instead of buying them for keeps. It’s a way for a community to pool resources and for individuals not to suffer the burden of ownership. If it were common to see this in neighbourhoods and the idea of borrowing, say, a lawnmower or a drill were a dependable one, it would be a real boon for minimalism and community spirit. Just as you don’t need to own Harry Potter and the Deathly Hallows because it’s definitely in your local public library, you wouldn’t need to own a drill if you knew there was one to be borrowed from the borrowing shop. I made the mistake of reading some of the comments thread in the article about the Berlin borrowing shop and it was filled with variations of the obvious criticism: how does it make money? Generously overlooking the fact that “making money” shouldn’t be the aim of every last goddam thing (especially a community initiative for the benefit of everyone), the answer would be to charge a nominal fee per lend. I don’t know why that would be a problem. Charge £2 per lend, perhaps with exceptions for the superpoor. Obviously. Everyone’s a winner. It’s a great step back toward common public resources (payphone, town clock, public baths) instead of the private ones we’re all supposed to love under Neoliberalism. Escapologist. Noun. (pronounced: es’cap·ol’o·gist). One who actively seeks to escape the imaginary manacles of modern life: work, debt, government, leisure industries, status and anxiety. Escapologists: we don’t do the ‘w’ word. By which I mean ‘Work’. Obviously. Most of us are pretty enthusiastic about walking, of course. And a few of us are WWOOFERs. And I know of a certain ‘w’ word which is the all-time number-one activity among the self-employed. And some of us are wannabe writers. And I once got an email from a reader who whittles. But apart from those ‘w’ words, we don’t do the ‘w’ word. Escapologists: we do lots of things that could be described as the ‘w’ word, but not very much of one particular ‘w’ word, that word being ‘work’. We try to avoid that. When I get my student loan bills, I ask myself many questions: should I get a regular job like a real grownup and just write on the side? When will I be able to afford to have children? Will this happen before my eggs go off? How long can I go on living on the cusp of financial ruin? Sometimes I put a dog poop in the toilet at work so the guys don’t think I only went in there to cry. Pre-order the forthcoming Issue Ten in print or on PDF today. As Owen thought of his child’s future, there sprang up within him a feeling of hatred and fury against his fellow workmen. They were the enemy–those ragged-trousered philanthropists, who not only quietly submitted like so many cattle to their miserable slavery for the benefit of others, but defended it and opposed and ridiculed any suggestion of reform. They were the real oppressors– the men who spoke of themselves as ‘the likes of us’ who, having lived in poverty all their lives, considered that what had been good enough for them was good enough for their children. You may have come across this kind of ‘oppression’ yourself if you work in an office and have ever mentioned your escape plan to a colleague. Escape, if you’ve already swallowed the blue pill, is both ridiculous and arrogant. See also: the legacy of submission.